Australia Capital Territory sets the bar! 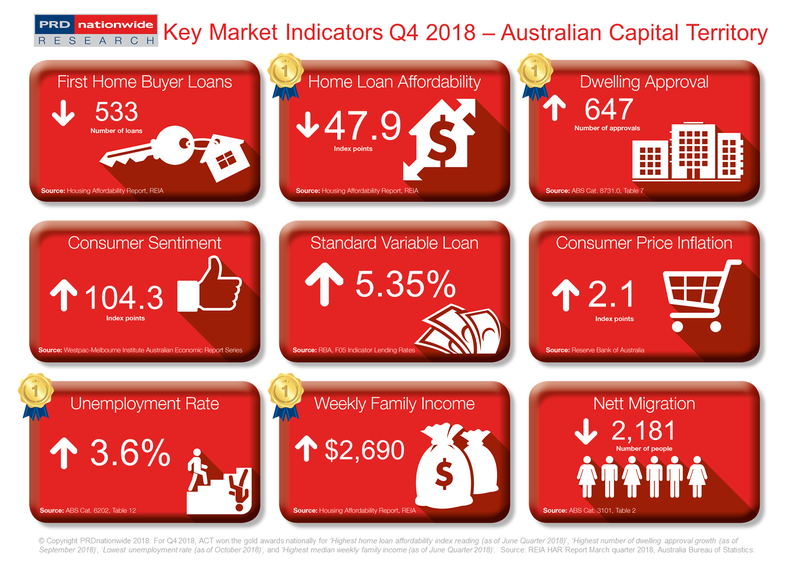 The Australian Capital Territory (ACT) can boast 4 gold awards nationally in the PRDnationwide Q4 2018 Key Market Indicator Awards, which is the highest number of gold awards achieved by any state or territory, making the ACT a top performer in Q4 2018. The ACT’s small scale in comparison to other states means it can stand tall for offering some of the best economic indicators this quarter. Perhaps most importantly, for homeowners, ACT won the gold award nationally for the highest home loan affordability index reading (as of June quarter 2018) with 47.9 index points. This was coupled with the gold award nationally for highest median weekly family income (as of June quarter 2018) at $2,690, representing a 2.2% growth over the past 12 months to the June quarter of 2018. High incomes and great affordability position the ACT as a leader in the market for those seeking to enter the property market. Furthermore, this quarter the ACT saw its lowest unemployment rate of just 3.6%, earning the territory the gold award nationally for lowest unemployment rate (as of October 2018). While it is important to note this rose from October 2017, it is still a very healthy rate when compared to the Australian national unemployment rate benchmark of 5.0%. Combined with a high home loan affordability index reading, this suggests a greater chance for first home buyers to enter the ACT property market in the near future. There is an upswing in residential development activity within ACT, earning it a gold award nationally for the highest number of dwelling approval growth (as of September 2018), up by 64.2% to reach 647 approvals. This surge in dwelling approvals indicates an increasing demand for housing stock within the ACT, emphasising a healthy economic position and market demand.